I have always been involved in sport, through high school I ran cross-country in the fall, Nordic skied in the winter and ran track in the spring. I went on to pursue a Phys Ed degree at Queen’s University. Developing a passion for the mechanics of the body and how to deal with injuries. Which lead to training in the field of Athletic Therapy and becoming a certified Athletic Therapist. After graduating from Queen’s my triathlon racing career started. 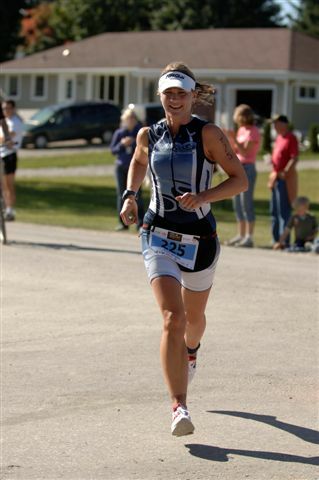 First I competed in sprint races and I slowly progressed to racing Ironman. My first Ironman was finished in just under 13hours and I was hooked! I decided that in order to get faster I needed a more structured thought-out training plan so I worked with NRG PT Head Coach Nigel Gray (my brother) to put together a detailed plan to get faster. This included proper heart rate zones and power analysis of my riding. This allowed me to take over 75min off my PB, finish 3rd in my age group and qualify for Hawaii in Ironman Brazil 2004. This has also given me a much greater understanding and appreciation of the uses and advantages of a properly designed training program that incorporates individualized heart rate and power zones. My coaching career really started back in high school where I taught sailing for 10 years, it was here that I learned how to work with athletes to achieve their goals. Previously as Director of Athletes First I oversaw the implementation of the coaching programs, designed and instructed triathlon clinics, written clinic manuals and led indoor cycling sessions. I am a Bike Fit Specialist and I have had the opportunity to provide many people with comfortable, aerodynamic bike fits over the years. As an Associate Coach with NRG Performance Training I have the opportunity to draw on my experiences as a Coach, Athletic Therapist and an athlete which includes the experience of guiding many athletes to reach their dreams. I look forward to working with you in pursuing your fitness and racing goals.